The Super Smash Bros. series of games were great because they let gamers settle some of those long-running arguments they'd had with friends since they were children: "Mario could totally beat up Link!" "Nuh-uh, Link has the Master Sword!" (Don't lie, you know you did it too). There's just something to be said about so many icons of childhood gaming nostalgia in one place. Super Mario Crossover works on that principle, but instead teams these classic NES icons up to take on the Koopa Troop invading the Mushroom Kingdom. It's the same as the classic Super Mario Bros., only instead of selecting Mario and Luigi you get to choose between Link, Mega Man, and the guy from Contra, too. Perhaps the best part is that the characters still play like they do in their original games. Samus curls into a ball and drops mines, Simon Belmont whips things and can't change direction in mid-air, Link throws boomerangs - combined with the classic character music over the levels, it's just one blast of nostalgia after another. 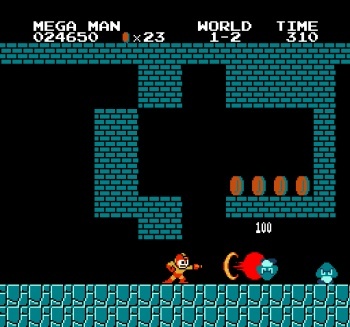 Personally, I'm partial to Mega Man in this one. He's way overpowered.